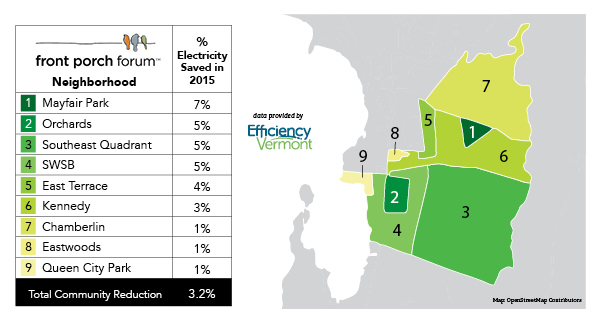 The South Burlington Energy Committee, Front Porch Forum, and Efficiency Vermont partnered together to create a map of the city that displays changes in residential electricity consumption. The incorporation of neighborhood boundaries has added a relevant new dimension to the tool’s visualizations. The tool calculates changes in each of the Front Porch Forum neighborhood’s average kWh use per home. A new understanding of community electricity use in the residential and municipal sectors has been inspired by three Vermont teams, South Burlington, Montpelier, and Waterbury/Duxbury, who are participating in the Georgetown University Energy Prize. The City of South Burlington and their partners have worked together to develop innovations in communicating trends in residential electricity and natural gas use. The result: South Burlington used less electricity per capita in 2015 than had been used in 2013 and 2014. South Burlington Residents can look for the Map Update in The Other Paper this Fall (pp. 14-15) to see how each neighborhood is performing in 2016.